Make sure the L-arginine supplement you take passed our test and is right for you! L-arginine (also referred to as just arginine) is an amino acid that may increase blood flow and is promoted for improving symptoms of certain cardiovascular diseases, as well as for improving exercise and sports performance, and sexual function. But does arginine really help with all of these conditions? And, if it does help, which arginine supplements are best? 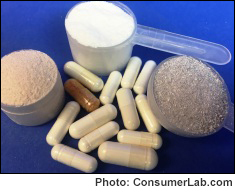 To answer these questions, ConsumerLab.com carefully reviewed the clinical evidence, and purchased, tested, and compared popular arginine supplements. We found one product contained less L-arginine than claimed on the label. Among those that contained what they claimed, we identified those that provide the best value — making them our Top Picks. We found the quality of products to be generally high. However, the suggested dosage of L-arginine for some products may not be effective for their expected use. We also found the cost of L-arginine varied among products, with some offering better value than others. You must be a ConsumerLab.com member to get the full test results along with ConsumerLab.com's findings, recommendations, and quality ratings. You'll get results for 18 L-arginine supplements: ten selected by ConsumerLab.com and eight that passed the same testing in our voluntary Quality Certification Program. There's also information about one product that is similar to one which passed testing but is sold under a different brand name.